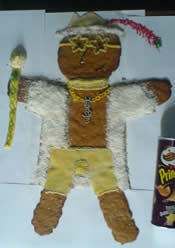 Being big fans of pimpthatsnack.com we just knew we had to make something but we couldn't figure out what. Every time we came up with a good idea, someone beat us to it. 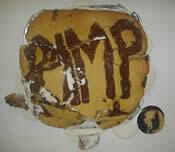 After a trip to the corner shop it became clear... the answer was staring us in the face - we took the hint, and quite literally pimped that snack (the cadbury shortcake snack that is). 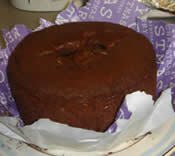 The super chocolatey, understated king of shortcake. First, a wiz around the local tescos (note : bring own forklift truck - 1.5 kg of flour is not for the faint hearted - Caz's arms still look like Stretch Armstrong's). We were on a budget so bought the cheapo ingredients which was our downfall, as cadbury's chocolate would have tasted 10 x better. Next, purchase coloured cardboard e.t.c for homemade packaging. Once ready to start, have arguments over best way to tackle the project - we call this having artistic differences ("Yeah right - you just can't take it that I'm always right" - Caz). Then find suitably large baking tray and a calculator. 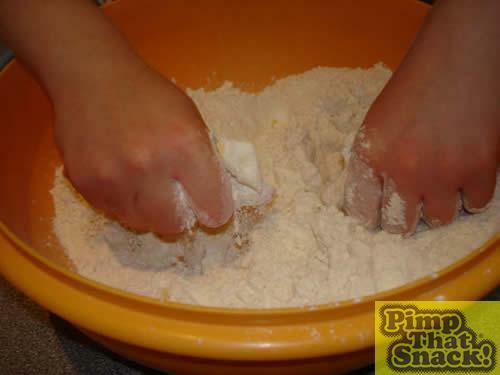 Use calculator to multiply a simple shortcake recipe by 6! Put on aprons and chef's hats and get to work. 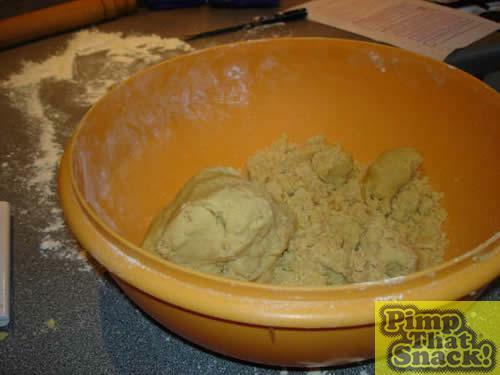 1) Put 360g of butter, 660g of flour and 240g of sugar in one super size bowl. 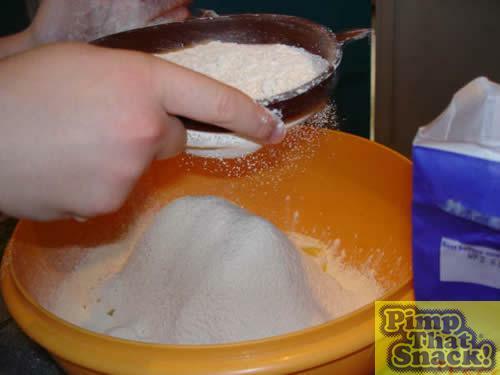 3) Add milk (if the mixture is too crumbly) and mould into a football sized ball. 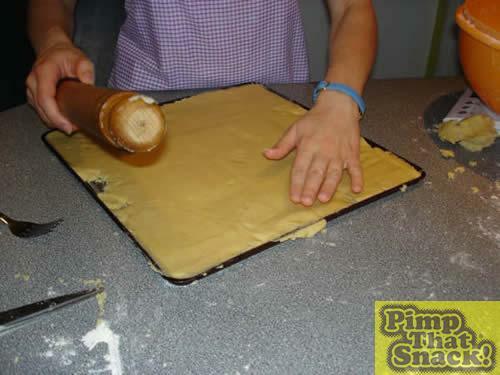 4) Press into baking tray, with every utensil available (rolling pins are particularly useful). Flatten mixture until it is as smooth as... a very smooth thing. 5) Pre-heat oven, and slide the monstrosity within it's fiery depths (ignore pathetic cries for mercy). 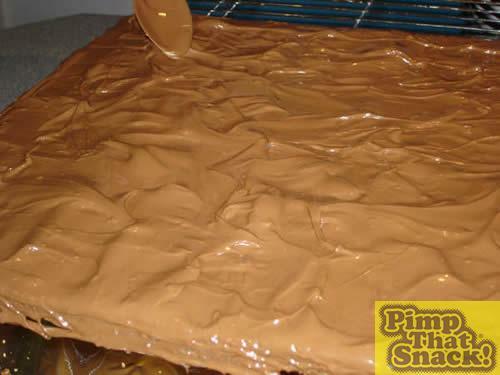 Leave in for about 15-20 mins and remove, leave to cool. 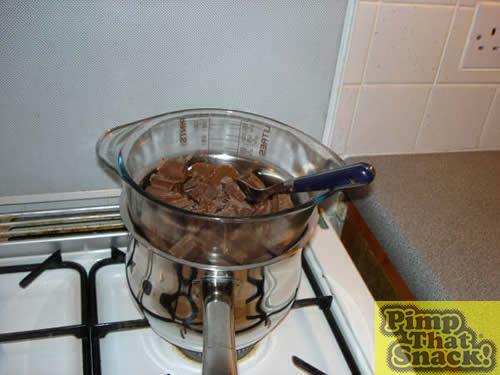 6) Start melting chocolate (pan and water method was used - as it is so much classier than a microwave darling! Also no harmful rays to fry you brain...) We found 3 bars for the top worked well. Create mountainous region to rival the alps with a spatula (for an authentic look).